We know why both of these guys are in the news right now. A few years ago, before the Internet, Joe Posnanski was our secret. He was the best sports writer in the country, and he was based in KANSAS CITY. We got to read his Thanksgiving columns. We got to read why, in jest but only sort of, the Royals would win the AL Central that year. And no one else did. Posnanski might be the most famous sports writer in America now, criticized by as many as he is lauded because of his new book Paterno. Roddick is relevant again for more celebratory reasons. He announced his retirement yesterday. He’s thirty years old, and tennis has taken its toll on his body, slowing his swift serve and halting him rushing to the net. Not everyone can be Federer, ageless and without injury. Roddick knows this better than anyone. He’s spent his entire career, one marked by a Grand Slam, eight consecutive years in the top ten and probably the best sound bites this side of John McEnroe, in Federer’s shadow. In July 2009, Roddick and Federer played one of the best tennis matches I’ve ever seen. They played five sets, stretching to thirty games in the final set. It was powerful but beautiful tennis. Serves won and lost the match. No one wanted to give up a break until Roddick did. Unlike Federer, he is not invincible. This match mattered so much to me that I decided to write about it a year later here at the Brew House. Obviously, I couldn’t do justice. That day at Wimbledon, Roddick transformed in front of our eyes from an occasionally-funny, occasionally-petulant afterthought into a true warrior. In five hours of agony, Roddick did what he couldn’t do all those years in the top ten when his serve was recording speeds of 150 mph. He made us care about him. All of a sudden I started to think about his good qualities, the qualities people are writing about today. Roddick once saved a man’s life at hotel fire in Rome. Aside from Andre Agassi, he’s done more for charity than any American tennis player. He’s freaking hilarious. Well, I guess I’ll complete the writing tri-fecta this week. So let’s start here: My life has been consumed by New Jersey for the past 30 days. I wrote a 60-inch profile on Charlie Weis, KU’s new football and an unapologetic son of New Jersey; I caught up with Tyshawn Taylor earlier this week and talked about the gentrification of Hoboken; my roommate for the next year grew up right outside of Newark; and on Tuesday, I watched New Jersey Governor Chris Christie give the keynote speech at the Republican National Convention and drop a Bruce Springsteen reference. 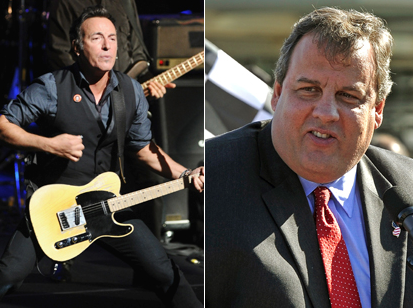 My roommate immediately turned to me: “Springsteen won’t talk to him,” he said of Christie. “He hates him.” That’s when my roommate recommended this story from earlier this summer in The Atlantic. Christie, you see, is not some fake Springsteen-ophile, pretending to be hip to further his political career. In fact, based on the story, he may be the most artist-obsessed politician I’ve ever seen. In the piece, Goldberg attends a Springsteen show with Christie in Newark.